We are employing the Cell-in-a-Box® technology as a platform to develop therapies for solid cancerous tumors using targeted chemotherapy. Our live-cell encapsulation technology-based therapies consist of encapsulating different types of genetically modified living cells depending on the disease being treated. For our leading product candidate, a therapy for pancreatic cancer, about 10,000 genetically modified live cells that produce an enzyme which converts the chemotherapy prodrug ifosfamide into its cancer-killing form are encapsulated in porous, spherical, pinhead-sized capsules, composed largely of cellulose. About 300 of these capsules are placed in the blood supply as close to the tumor in the pancreas as possible. Then about one-third the normal dose of the chemotherapy prodrug ifosfamide is given to the patient intravenously. The prodrug is normally activated in the patient’s liver. 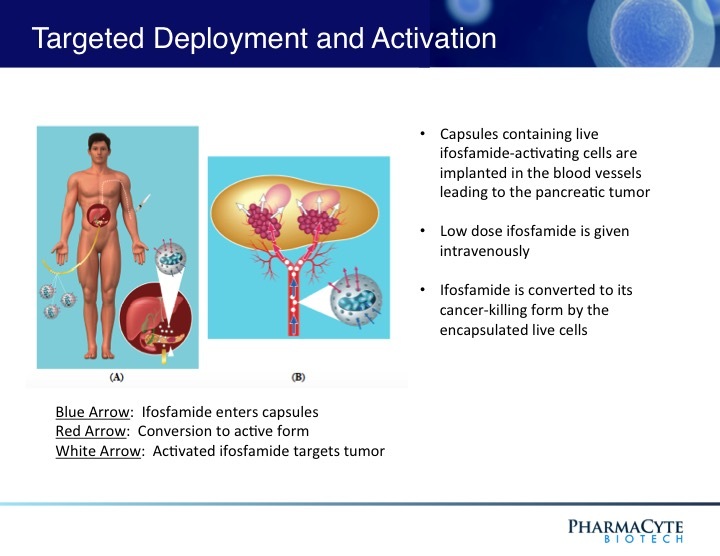 By activating the prodrug near the tumor using the Cell-in-a-Box® capsules, our cellular therapy acts as a type of “artificial liver.” Using this “targeted chemotherapy,” we are seeking to create an environment that enables optimal concentrations of the “cancer-killing” form of ifosfamide at the site of the tumor. Because the cancer-killing form of ifosfamide has a short biological half-life, we believe that this approach results in little to no collateral damage to other organs in the body. We also believe this treatment significantly reduces tumor size with no treatment-related side effects. As shown above, the presence of the capsules in the blood vessel leading to the tumor do not prevent the blood flow to the tumor. Since the cancer-killing metabolite of ifosfamide has a short half-life, we believe will result in little to no collateral damage to other organs in the body. In an earlier Phase 1/2 clinical trial which used our pancreatic cancer treatment in very sick patients with advanced pancreatic cancer, this targeted chemotherapy not only reduced the tumor size but also resulted in no obvious adverse side effects attributable to the therapy. PharmaCyte’s pancreatic cancer treatment has received the Orphan Drug designation from drug regulatory authorities in the U.S. and the E.U. This designation carries with it 7 years of marketing exclusivity in the U.S. and 10 years in the E.U. after the product has been approved for marketing by these regulatory authorities. Pancreatic cancer is a very aggressive cancer with a poor prognosis. It is the third leading cause of cancer-related deaths in the U.S. and the seventh leading cause of cancer-related deaths globally. The five-year survival rate is 8%, reportedly the lowest survival rate of any cancer. It is expected that in 2017 there will be more than 53,000 new cases diagnosed in the U.S. In Europe, the estimate is approximately 80,000. Unfortunately, about 72% of patients will die within the first year of diagnosis. More than 90% will die within two years of diagnosis. Without treatment after diagnosis, patients have a 3-6 month median life expectancy. Patients with pancreatic cancer are not normally diagnosed until the cancer is advanced and inoperable. There is no cure for pancreatic cancer unless the tumor is surgically removed in its earliest stages of growth. Since the first drug (gemcitabine) was approved in the U.S. for pancreatic cancer in 1996, approximately 40 registrational clinical trials have been conducted. In spite of this, little improvement in median survival time and percentage of one-year survivors has occurred. Most success was achieved when gemcitabine was given in combination with another chemotherapy drug. 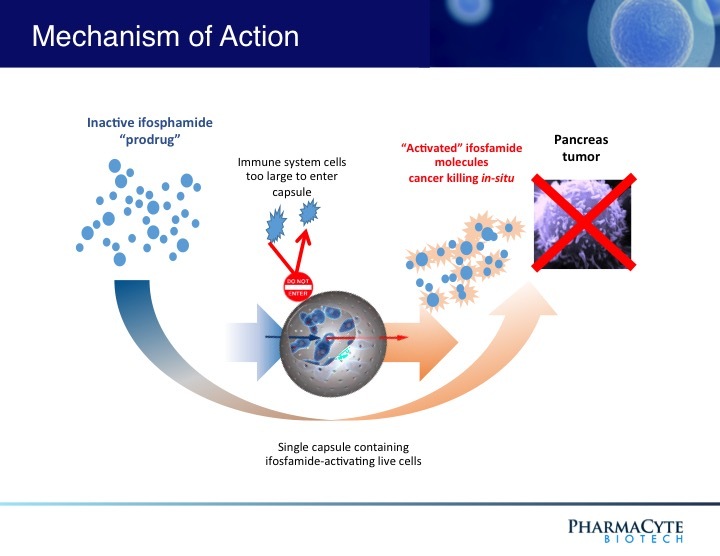 The current standard of care for advanced pancreatic cancer is the combination of Abraxane® (a nanoparticle albumin formulation of the drug paclitaxel (Taxol®) plus gemcitabine or the 4-drug combination known as FOLFIRINOX (fluorouracil, leucovorin, irinotecan and oxaliplatin). Abraxane® plus gemcitabine was approved by the U.S. Food and Drug Administration (“FDA”) in September 2013. This combination increased the median survival time by 1.8 months, as compared to gemcitabine alone. It increased the one-year survival time from 22% with gemcitabine alone to 38% with Abraxane® plus gemcitabine. FOLFIRINOX has never been approved by the FDA or any other regulatory agency such as the European Medicines Agency (“EMA”), but was introduced to clinical practice in 2010 due to the results of a Phase 2/3 trial comparing FOLFIRINOX with the single-agent gemcitabine as first-line treatment for patients with metastatic pancreatic cancer. Median overall survival was superior with FOLFIRINOX over gemcitabine. Since the conclusion of that trial, oncologists in Europe began using it as first line therapy. That trend has increased in the U.S. despite the FDA approved combination of Abraxane® plus gencitabine. However, there are severe side effects associated with each chemotherapy combination. A critical unmet medical need exists for patients with locally advanced, unresectable, non-metastatic pancreatic cancer (“LAPC”) who no longer respond to first-line therapy with either Abraxane® plus gemcitabine or the 4-drug combination known as FOLFIRINOX – the current first-line standards of care for advanced pancreatic cancer. These patients have no effective treatment alternative once their tumors no longer respond to these therapies. Two of the most commonly used treatments are 5-fluorouiracil (“5-FU”) or capecitabine (a prodrug of 5-FU) plus radiation. Both treatments are only marginally effective in treating the tumor and result in serious side effects. Other treatments are being tried in an attempt to address this problem, but their success is far from certain. We are developing a therapy that we believe can serve as a “consolidation therapy” with the current standards of care and address the critical unmet medical need discussed above. Subject to FDA approval, we plan to commence a clinical trial involving patients with LAPC whose tumors have ceased to respond to either Abraxane® plus gemcitabine or FOLFIRINOX. We had a Pre-Investigational New Drug Application (“Pre-IND”) meeting with the Center for Biologics Evaluation and Research of the FDA (“CBER”) in January 2017. At the Pre-IND meeting, the FDA communicated its agreement with certain aspects of our clinical development plan, charged us with completing numerous tasks and provided us with the guidance on the tasks we need to complete for a successful Investigational New Drug Application (“IND”). The proposed clinical trial is designed to show that our Cell-in-a-Box® plus low-dose ifosfamide therapy can serve as an effective and safe consolidation chemotherapy for patients whose tumors no longer respond after four to six months of therapy with Abraxane® plus gemcitabine or FOLFIRINOX. The trial will initially take place in the United States (“U.S.”) with possible study sites in Europe later in the trial. In a previous Phase 1/2 open-label, single site 14-patient clinical trial using our therapy and in which only two courses of ifosfamide were given, our treatment was shown to be safe and effective. (See Figure 3). 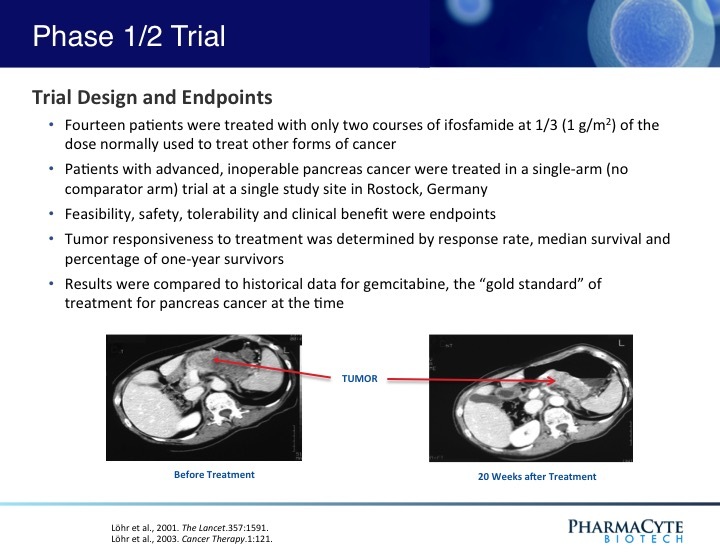 In fact, when the results of that trial were compared to historical data for gemcitabine (the “gold standard” for pancreatic cancer at the time that this trial was conducted) the percentage of one-year survivors was double that previously reported for gemcitabine, the median survival of patients was substantially increased as compared to gemcitabine, and in contrast to gemcitabine, no treatment-related side effects were seen with our therapy. Interestingly, in 3 of the 14 patients, their advanced-stage tumors were reduced in size to the point where they would have been operable. 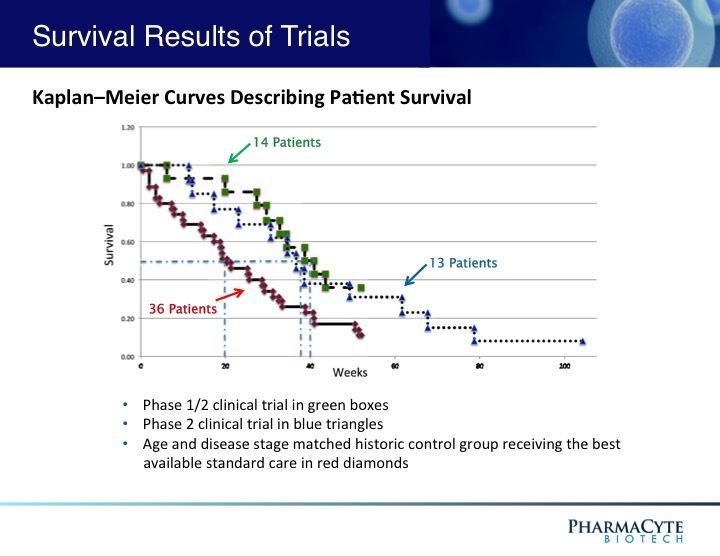 The trial will be a prospective, multicenter, randomized, open-label Phase 2b study to evaluate the efficacy and safety of CypCapsTM (genetically engineered human cells encapsulated using the Cell-in-a-Box® technology) in combination with low-dose ifosfamide as compared to chemoradiation therapy with capecitabine plus external beam radiation therapy (“EBRT”) or stereotactic body radiation therapy (“SBRT”) alone. The study population will consist of approximately 100 patients. Patients will be randomized in a 1:1 ratio to either treatment with the study therapy or a comparator. The randomization will be stratified by previous treatment (Abraxane® plus gemcitabine or FOLFIRINOX) and the control arm choice (capecitabine/EBRT or SBRT). The primary objective will be determined by progression free survival (“PFS”). 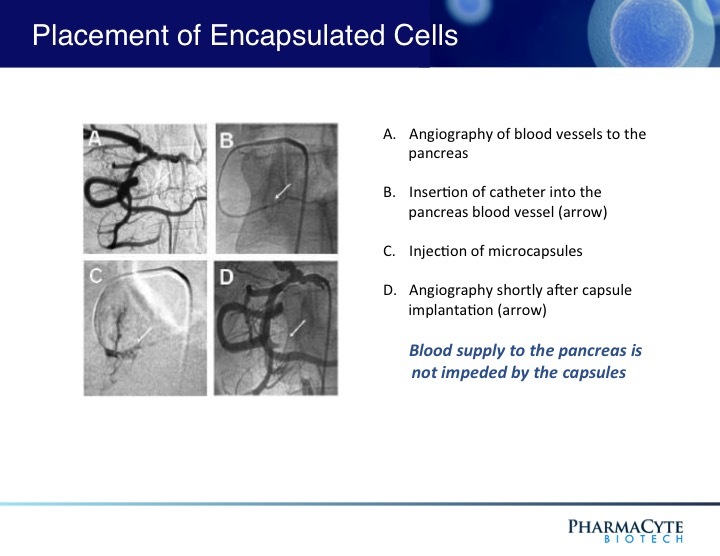 The secondary objectives for this study are to determine if CypCaps plus low-dose ifosfmide will: (i) increase overall survival (“OS”); (ii) increase objective response rate; (iii) increase the rate of conversion from unresectable to resectable pancreatic cancer; (iv) decrease the pancreatic cancer tumor marker CA 19-9; and (v) improve a patient’s quality of life. In addition, this study will assess the safety, tolerability and immunological response of CypCaps plus low-dose ifosfamide. About 1 in 8 U.S. women will develop invasive breast cancer over the course of her lifetime. In 2018, an estimated 266,120 new cases of invasive breast cancer are expected to be diagnosed in women in the U.S., along with 63,960 new cases of non-invasive (in situ) breast cancer. About 2,550 new cases of invasive breast cancer are expected be diagnosed in men. Approximately 40,920 women in the U.S. are expected to die in 2018 from breast cancer, though death rates have been decreasing since 1989. These decreases are thought to be the result of treatment advances, earlier detection through screening and increased awareness. However, for women in the U.S., breast cancer death rates are higher than those for any other cancer besides lung cancer. Worldwide, in 2018 there were over 2 million new cases of breast cancer diagnosed. Also, breast cancer is the most commonly occurring cancer in women throughout the world and the second most common cancer overall. According to the American Cancer Society, ten different chemotherapeutic drug combinations have been widely used for years to treat various forms of breast cancer. Nine of these ten combination chemotherapies use the anticancer drug cyclophosphamide (Cytoxan®) as one of the components of the combination. 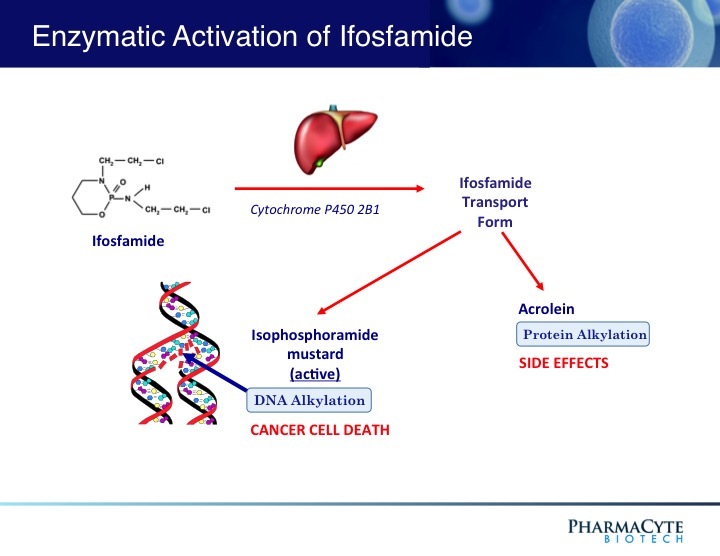 Cyclophosphamide is a “sister” drug to ifosfamide – the anticancer agent used in the clinical trials in patients with advanced, inoperable pancreatic cancer using PharmaCyte Biotech’s treatment for pancreatic cancer. Both drugs are classified as “prodrugs” and must be activated (converted to their cancer-killing form) for them to be effective. The cytochrome P450 enzyme system in the liver activates both cyclophosphamide and ifosfamide. contain an isoform (known as CYP2B1) of the cytochrome P450 enzyme system and are efficient at activating ifosfamide. Because of the similarities between ifosfamide and cyclophosphamide, the same encapsulated cells as those used in the pancreatic cancer clinical trials should efficiently and effectively activate cyclophosphamide into its cancer killing form in developing a novel treatment for breast cancer. To test this hypothesis, Cell-in-a-Box® capsules containing cells with high CYP2B1 activity were used in combination with cyclophosphamide in a veterinary Phase 1/2 veterinary clinical trial in dogs with spontaneously-occurring mammary tumors. This is a good animal model system for testing the effectiveness of cyclophosphamide in treating breast cancer in humans because the development and pathological features of mammary tumors in dogs are very similar to those seen in breast cancer in women. Spontaneous mammary tumors account for about 70% of all cancers in dogs. Usually such tumors are removed surgically, but it has been estimated that more than 55% of dogs develop new cancers after such surgery. Cyclophosphamide was chosen for this veterinary Phase 1/2 trial rather than ifosfamide because it is often used to treat breast cancer in women as well as mammary tumors in dogs. In addition, as noted above, it is a component of most combination chemotherapy regimens used against breast cancer in humans. A total of 16 dogs were enrolled in the preclinical trial. The dogs were divided into two groups. One group of 6 dogs was treated intravenously with cyclophosphamide alone at a dose of 7 mg/kg of body weight, in four treatments on days 2, 9, 22, and 29. In the 10 other dogs, 20 Cell-in-a-Box® capsules containing the cyclophosphamide-activating cells were implanted at 5 sites around their tumors on day 0 (two days before administration of the first dose of cyclophosphamide) and then cyclophosphamide was administered in the same regimen as the other 6 dogs. Three of the 10 dogs treated with the encapsulated cells/cyclophosphamide combination had two tumors as did one dog treated with cyclophosphamide alone. As in the pancreatic cancer clinical trials in humans, the capsules and the cells within them were well tolerated – no “safety” issues were seen in the dogs that could be related to the presence of the capsules or to their implantation over the entire 56-day observation period. Although mild side effects from the use of cyclophosphamide were observed in both groups of dogs, these were no more severe than those seen when this drug is used alone to treat mammary cancer in canines. The final evaluation of the effect of the treatments on tumor size were graded as follows: Complete remission (CR), Partial remission (PR) – regression of the tumor by at least 50% of the initial tumor mass, Stable disease (SD) – regression of the initial tumor mass by less than 50% or its enlargement by less than 25%, Progression of disease (PD) – increase in initial tumor mass of at least 25% or the occurrence of new tumors. Six of the 11 tumors treated with the encapsulated cells/cyclophosphamide combination showed a PR while the other 5 showed SD. Of the 7 tumors in the 6 dogs that received cyclophosphamide alone, 6 tumors showed SD and the other exhibited PD. The median tumor size reduction of the tumors in dogs treated with the combination was 53%. This is in contrast with only a 21% reduction of the size of the tumors in the dogs treated with cyclophosphamide alone. For one of the dogs with two tumors in the combination-treated group, both tumors showed a similar reduction in size (65% and 62%). In a second dog with two tumors in this group, one tumor that received the combination treatment was reduced in size by 70% while the other tumor, which was exposed to cyclophosphamide alone, was reduced in size by only 14%. The tumors in dogs that were administered cyclophosphamide alone were reduced in size by only about 19%. We are also developing a therapy to delay the production and accumulation of malignant ascites fluid that results from abdominal tumors. Malignant ascites fluid is secreted by such tumors into the abdomen after the tumor reaches a certain stage of growth. This fluid contains cancer cells that can seed and form new tumors throughout the abdomen. Malignant ascites fluid accumulates in the abdominal cavity, causing swelling of the abdomen, severe breathing difficulties and extreme pain. Malignant ascites fluid must be surgically removed on a periodic basis. This is painful and costly. There is no available therapy that prevents or delays the production and accumulation of malignant ascites fluid. We have been involved in a series of preclinical studies at TD2 to determine if our pancreatic cancer therapy can delay the production and accumulation of malignant ascites fluid from abdominal cancers. If successful, we plan to conduct a clinical trial in the U.S. with additional study sites in Europe. As for the pancreatic cancer study, TD2 will conduct this trial in the U.S. and CNS will conduct it in Europe in alliance with TD2.